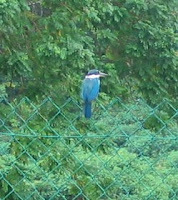 These real life kingfishers from my garden, can be quite noisy but when they perch on my fence they are very silent and still and make good companions. 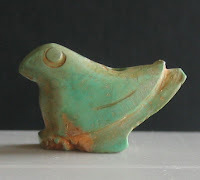 Those are the real birds now for my turquoise simulation. 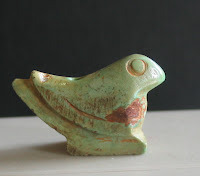 My turquoise bird bead is tiny and measures 2.5x1.5cm. The body is plain except for one incised line near its upswept double level tail. 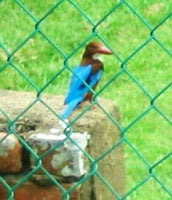 Its round eyes look serious and thoughtful not unlike my kingfisher companions at the backyard. The legs are not drawn and ends in a pedestal. The perforation is top down and could have been used as a Pei and worn from the waist. Because of its smallness it could also have been an ornamental element in a necklace. There are marks all over its body and circular marks around the eyes. 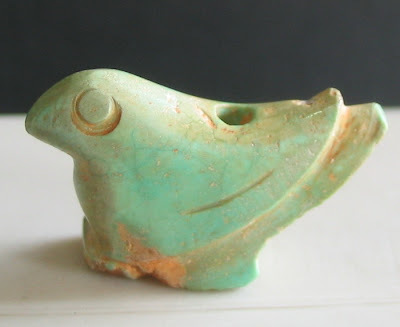 It has the qualilties of an archaic bird but I can't find a good enough comparison to specify a period.